A mysterious rock which appeared in front of the Opportunity rover is “like nothing we’ve ever seen before”, according to Mars exploration scientists at Nasa. Experts said they were “completely confused” by both the origins and makeup of the object, which is currently being investigated by Opportunity’s various measuring instruments. Astronomers noticed the new rock had “appeared” without any explanation on an outcrop which had been empty just days earlier. The rover has been stuck photographing the same region of Mars for more than a month due to bad weather, with scientists at the Jet Propulsion Laboratory (JPL) in California monitoring the images it sends. 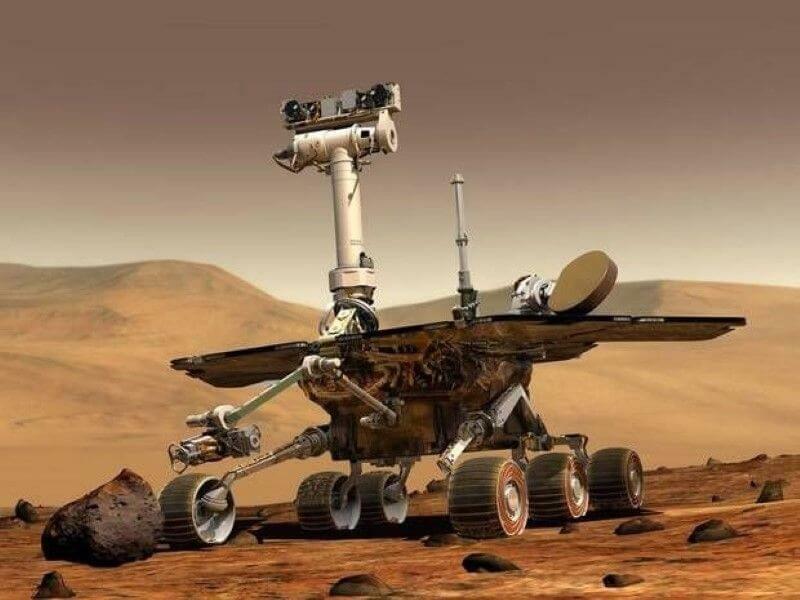 Nasa issued a Mars status report entitled “encountering a surprise”, and lead Mars Exploration rover scientist Steve Squyres told a JPL event it seems the planet literally “keeps throwing new things at us”. He said the images, from 12 Martian days apart, were from no more than a couple of weeks ago. “We saw this rock just sitting here. It looks white around the edge in the middle and there’s a low spot in the centre that’s dark red – it looks like a jelly doughnut. “We had driven a metre or two away from here, and I think the idea that somehow we mysteriously flicked it with a wheel is the best explanation,” Squyres said. Yet the story got even stranger when Opportunity investigated further. Squyres explained: “We are as we speak situated with the rover’s instruments deployed making measurements of this rock. “We’ve taken pictures of both the doughnut and jelly parts, and the got the first data on the composition of the jelly yesterday. “It’s like nothing we’ve ever seen before,” he said. “It’s very high in sulphur, it’s very high in magnesium, it’s got twice as much manganese as we’ve ever seen in anything on Mars. “I don’t know what any of this means. We’re completely confused, and everyone in the team is arguing and fighting (over what it means). Squyres was speaking at an event marking the 10th anniversary of the arrival of Opportunity and Spirit on the surface of Mars. Opportunity had covered just over 24 miles (38km).